Transport your travel trailer and RV anywhere in the U.S. We are your reliable solution for towing and hauling of recreational vehicles and travel trailers. 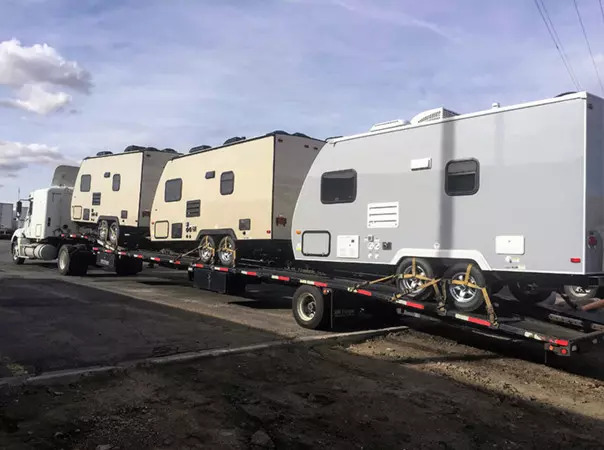 With over 15 years of travel trailer hauling experience, we are equipped with the experience to safely transport fifth wheel trailers, motor-homes, cargo trailers, toy haulers, camper vans and other trailer types across state or across the country. Our highly skilled, experienced drivers are ready for any trailer hitch combination including fifth wheel hitch, bumper pull, gooseneck, pintle hook and other various types of ball hitches. Type of RV or Trailer: Is your RV or travel trailer a 5th Wheel, Toy-Hauler, Cargo Trailer, Double-Decker etc.? Condition of RV or Trailer: Is your trailer in operable condition? Pickup Location: We’ll kindly ask we meet our driver at a nearby location with enough ample space to safely load your RV or travel trailer. Route: We need to make sure there are no road restrictions to avoid that prohibit your trailer from traveling through. What’s the Difference Between RV Transport & Trailer Transport? It’s important to understand the differences in recreation vehicles and travel trailers, especially when it comes time to transporting. Although these terms — among others — are often used interchangeably, there are some notable differences. Recreational vehicles are typically some sort of motor-home. They are equipped with a few of the amenities of home and can be motorized or non-motorized. RV movers will generally haul, tow or drive-away the recreational vehicle to its destination. 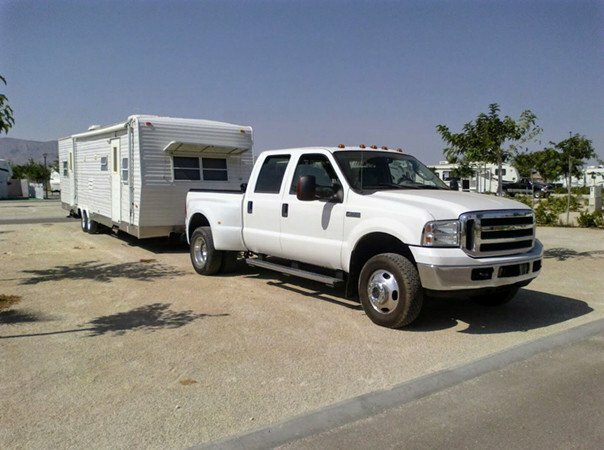 RV Towing: Most often, a dually pickup truck with a matching hitch will hook up and tow the RV. RV Hauling: Recreational vehicle is loaded on to a wedge or flatbed trailer for transport. There is no towing involved. RV Drive Away: A personalized driver will get behind the wheel and drive the RV to delivery destination. Trailers are basically an unpowered vehicle towed by another. Trailers are used for a combination of things, but generally the function of a trailer is to haul something. The important thing to know about a trailer is that they are not motorized. Trailer Towing: Most often, a dually pickup truck with a matching Bumper Pull or Fifth-Wheel hitch will hook up and tow the trailer. Trailer Hauling: Trailer is loaded on to another wedge or flatbed trailer for transport. There is no hooking and towing involved. We ask that you carefully prepare your RV and travel trailer for transport. Following these simple steps will help make sure that there are no safety incidents or delays during your RV or travel trailer transport. 1 | Trailer Lights: Check your trailer lights to ensure they are working properly. ( brake, turn, clearance, license plate etc.) Trailer Wheels & Axles: Inspect the wheels and axles on your trailer for proper lubrication. It is recommended that bearings, bearing seals and bearing cups on a trailer be greased every 12 months or 12,000 miles. 2 | Trailer Weight: Do NOT overload your trailer. Check the gross trailer weight rating (GTWR) of your trailer to prevent overloading. 3 | Trailer Hitch: All trailers have a designated hitch type depending on their gross trailer weight. It is important that your trailer have the proper hitch type to safely tow. 4 | Personal Items: Any personal items inside your trailer or RV must be properly secured. Make sure cabinet doors are closed, locked if possible, and any items that are not mounted, be removed or placed in a secure area in the trailer. 5 | Trailer Power Supply: Disable your trailer’s power supply. 6 | Hazardous Materials: Gas tanks, propane tanks, ammunition or any possible dangerous materials should be removed from the trailer. Our carriers can be fined if such items are found in the trailer while in transport.